The front squats are one of the best exercixes for building those quads! The front squats differ from the back squats because you are actually putting the bar in front of your body (the anterior part of your body), supporting it with the clavicle portion. This is considered a more advanced movement, so the BUFF DUDES are going to break it down step by step you can get that form down pat and start firing up those quads! The best way to perform a front squat is in a squat back at chest level; that way you can simple walk up to the bar, lift, and go. When you take the bar off the squat rack, you can place it either in a cross/clean arm position*. You are going to step back, start about shoulder width in stance, toes slight pointed out, then slightly widen your stance from the initial position. Proper stance will ensure you are squatting between the legs; dropping your hips back and keeping your chest up. If your chest drops, you are going to be putting unnecessary pressure on the spine. Keep the core and lats really tight, that way everything remians stable throughout the motion. *What is the difference between cross hand grip and clean hand grip? The clean hand grip, when your hands and elbows are up, is going to be the better of the two in most cases because it allows you to keep the chest up and the elbows at a better angle. The stress of the bar is going to keep the bar up, which in turn keeps your chest up. With the cross hand grip, it is easier to drop the chest, shoulders, and elbows, which is something you do not want to do, of course. However, it is easier to get into this position, especially if you are a bulkier person or if you have inflexible joints. This is when you would want to utilize this grip form. 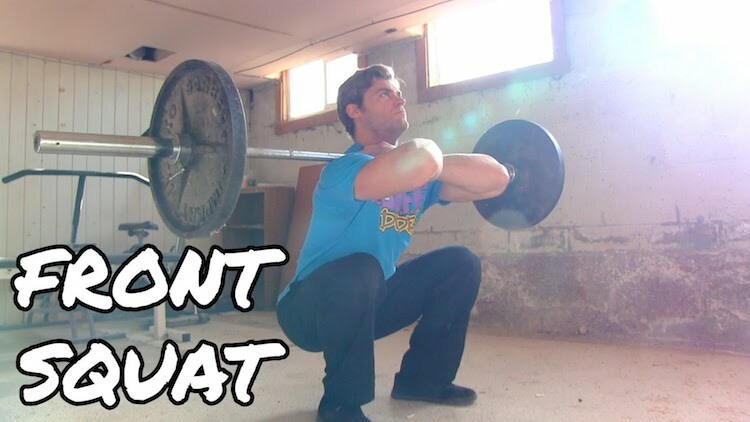 The range of motion in the front squat is all going to be relative to your body type, your flexibility, and even your confidence in the lift. What you ideally want to do is get at least 5 parallel squats to the floor, that way you are going to involve as much muscle as possible. If you are confident, experienced, or flexible enough you can even go below parallel. It is important, no matter how deep you go, that you keep your back straight and chest up. Once you nail the form, you can begin adding more weight, hitting those PRs and building those quads!